« The Contentious Issue of Copyright! Tape is Dead : Long Live Tape! We have come a long way since cave painting was used as a means of documenting or telling a story, but in the last century the rate of change has been dramatic, and over the last twenty-five years that progress has been exponential. Moving picture recording of any quality used to take a pantechnicon full of wire and associated hardware, is now available on a mobile phone. For the first three quarters of the 20th century, Film ruled supreme, then in the late 1970s and early ‘80s; tape came snapping at its heels. Film inheritently had its own archiving in the form of the negatives, which were storable for years and new prints could be struck with no fear of obsolescence. Film was beautiful, a black art form in its self, mysterious and expensive. Tape was comparatively cheap in comparison and the cameras were more accessible as domestic versions gave acceptable results for the masses. But the professional formats seemed to change almost annually. There was `Quad’, `one inch’, `‘U’matic’, `Beta’, `Beta-SP’, `SX’ and finally, in 1993 the much revered `Digibeta’ (digital betacam). The Beta format in its various guises stayed ahead of the various `DV-CAM’ and `DVC-PRO’ Semi-pro formats. And archiving on tape was both cheap and straightforward and the digital tape media could be dubbed and copied many times with very little generation loss. The 21st century has brought us to the next watershed, namely recording to solid-state media. Instant access to the video rushes, no winding through a cassette. Lower power consumption in camera, few moving parts! 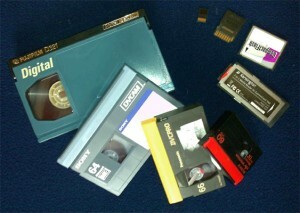 Tiny media cards – SD, Flash etc. Faster downloading of rushes into the edit system, not real time like tape! No ‘run up’ time from standby, so recording starts the instant the button is pushed (some cameras even have a built in ‘cache’, which means it is constantly recording over a 15 second memory slot if the camera is switched on!). …….to name but a few. But, if we thought film was expensive then the price of professional digital media cards - SxS, P2 etc - takes media costs to a whole new level. So as I slide toward having shelves full of portable Hard Drives at a Terabyte a time, but are they safe? What about archiving? One little knock, simply the drive falling onto its side can see you forking out for Data Recovery in a panic………….. The ‘in’ term is “work flow” and what ever that is, you have to ‘get it sorted’! I have been using a semi-pro Sony EX3 that uses a Sony bespoke media card since November last year and I’ve only really just worked out a safe and acceptable archiving system. I purchased a tiny Hewlett-Packard laptop with a built in Express card slot which allowed quick and easy downloading from my expensive Sony SxS cards to the hard drive of the HP note book and a 250 GB external hard drive. I now get two copies of 58 minutes of material on separate drives in about twelve minutes. So is this latest generation of solid-state media digital camcorders worth the trouble? The answer I think has to be a resounding yes. But……. Archiving is very easy and cheap with tape and the cost of archiving media cards is expensive. Putting a labelled camcorder tape box on a shelf is a lot easier than trying to store a SD card the size of your fingernail! Let alone remembering where you stored your students’ rushes on the hard drive! In the end it’s both a technical and budget driven argument. So to sum up, in my humble opinion, the future is bright and the future is ‘Solid’. And tape is dead, but long live tape! This entry was posted on Tuesday, June 23rd, 2009 and is filed under Cameras & Lighting, Post & Editing. You can follow any responses to this entry through RSS 2.0. You can leave a response, or trackback from your own site.